Please tell me about the album, the writing and recording, the themes, the inspiration etc. 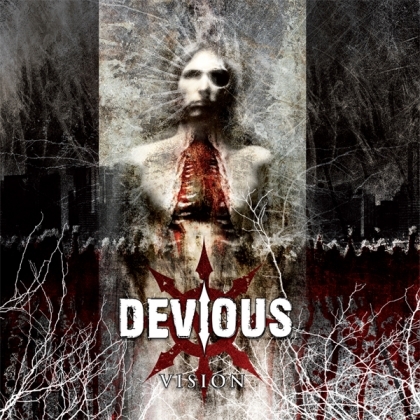 - We started writing for “Vision” in August 2008 and started the recordings in February 2009, so the songs have been written in a very short period of time. Just like before with “Acts of Rage” and “Domain”, Guido has been the main song writer for this album musically. Wouter and I are responsible for all of the lyrics. In the lyrics, we have chosen a different approach than the common “hack, slash, kill” or anti-Christian – pro Satan stuff. The main subject that holds the album together is “manipulation”. Actually it’s “indoctrination”, but that sounds too political and we are not trying to be a politically engaged band. Manipulation is everywhere; in our daily life, in politics, in the media, in entertainment... “Vision” is about realizing this and trying to gain control of how you see things yourself. What about the line-up changes? -In early 2008, our original singer Arnold came back, what brought Devious back to its original line-up. With Daniël Centiago replacing Sven van Toorn on bass at the dusk of 2008, the line-up became and is now semi-authentical. So how did you get all the ideas to melt together while recording? -As for the recording process, we agreed with our label (Deity Down Records) to split this up to gain the best result with the best people for every part of the job. Mix and master are done by Jochem Jacobs (Split Second Sound, Textures). Drums and vocals were recorded by Frank Klein Douwel (Sonic Assault Studio), who has also worked with Asphyx and Hail of Bullets. The guitar sound was created by Michiel Toenink (Napalm Death, Sick of it All) and Frank Klein Douwel at The Crown Studios. The overall process was supervised by Pascal Altena, with whom we have worked since our first album. Carsten Altena has provided us with some great synthesizer compositions and samplers, which give the album the finishing touch. All above have done a great job and we are very happy with the result. It sounds a bit cliché, but we consider “Vision” to be our best album so far, both musically and sound wise. Who or which persons/bands inspired you to start the band. -When we first discovered metal, like many bands we started off with thrash metal bands such as Megadeth, Slayer, Sepultura and Metallica. Those were the first musical influences to us. A while later, death metal bands entered our world, bands like Death, At the Gates, Immolation and Morbid Angel drew our attention. Influences of these bands are most clearly present on our first album “Acts of Rage” still. After this album, we got inspiration from a lot of different corners, even classical music. Carsten Altena’s synth compositions have brought a big deal of atmosphere to our songs, without pushing the intensity and aggression aside. What is the ultimate death metal to you? -When it comes to working hard to achieving their goals, coming up with quality studio albums and brutal energetic live shows for years and years, I’d have to say CANNIBAL CORPSE! What happens text (next?) in the Devious camp? -First we are doing the European tour with Entombed and Merauder in December. After that, we will do some club shows in Holland, Belgium and Germany. Also, try to catch us at some cool summer festivals summer 2010. The upcoming Entombed tour, how did you get it and where will you play? -We have done a support show for Entombed in the Netherlands, last May. We must have left quite an impression, because a while after this show, TMR Music (the touring agency) asked us to join Entombed on their European tour. We will play at clubs and festivals in The Netherlands, Germany, Czech Republic, Hungary, Slovakia, Switzerland and Austria. For the detailed schedule, check our website www.devious.nl. What will you aspire to achieve in the next few years? -The ideal situation for us would be to do a couple more tours in Europe and, hopefully, once or twice overseas. In the meantime we’ll do weekend shows in The Netherlands and surrounding countries. And we would like “Vision” to achieve international recognition, so fans will continue to supply us with enough juice to write an even better next album. This band is no coincidence, ENTOMED have already taken them under their wings for a European tour. Now do yourself a favor and check them out, or preferably get a copy of the album and/or catch them on tour!